The Peugeot electric salt mill brings a contemporary touch to fine tableware and elevates the flavour of dishes with a simple and elegant gesture that grinds the precise amount of salt required for each dish. Electric salt mill in stainless steel u'Select 20 cm - 8in. Electric salt mill in ABS grey quartz 17 cm - 7 in. 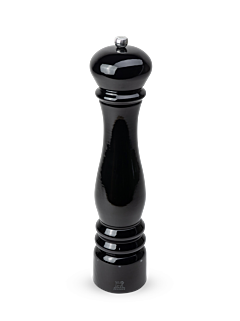 Electric salt mill in ABS Soft touch black 18 cm - 7in. Functional and refined, the Peugeot electric salt mill features understated and resolutely contemporary, softly curved lines. Designed to offer more efficiency in an ergonomic design, the mechanism is triggered by a single touch. Transparent sections in the body allow you to see at a glance how much salt remains. 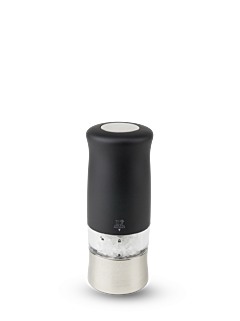 The Peugeot electric salt mill is available in black, a stainless steel finish or in coloured versions to dress the most sophisticated interiors, from the kitchen to the most beautiful dining tables. Practical and effortless, the Peugeot electric salt mill offers unparalleled simplicity, efficiency and speed. It is activated by a single touch and requires just one hand to operate thanks to its special easy-to-handle design. 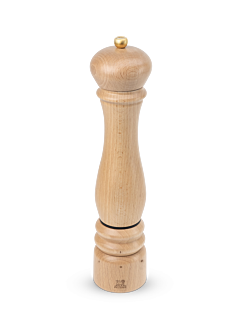 The sprinkling of salt is released in a regular, controlled and homogeneous way, for optimal seasoning of the dish.